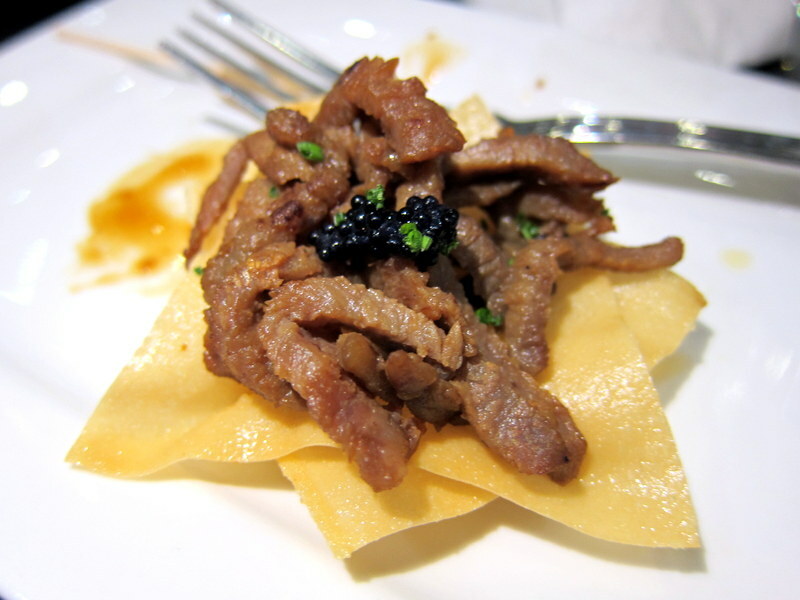 European (London) – Simply foodolicious! おいしい! 好吃! 맛있는! délicieux! delicioso! 好食! Flat Iron – a 200g steak at £10?! The title says it all, doesn’t it! What else could beat a £10 flat iron steak in London when everything isn’t exactly cheap? But the caveat holds, as the sides, sauces and desserts could push your bill up to £20 eventually which was what we did. No regrets though as that steak was just beautifully done at Flat Iron. Infamous for their relentless long queues at the one near Oxford Circus, we decided to make our way down to the much quieter Tottenham Court Road branch that Sunday! Quality ensured, yet without the crowd, we had a great lunch! Getting into that rustic, brick walled restaurant, and you realise it’s quite a hipster place actually. Laying on the table – Old fashioned mugs to fill your free popcorn appetiser which you munch on while waiting for the friend who is utterly late, a cute pepper grinder to spice up your beef, and that immensely cute chopper knife by the side (for what use I’m not so sure as the beef have been thinly sliced!). How creative could these cutlery get? And there we go, the £10 steak we have all been waiting for. Devoid of fats, they were amazingly tender and juicy while beautifully grilled on the surface to yield a lightly charred fragrance. While the Hong Kong buddy was satisfied without a sauce which I reckon could be eaten on its own, I preferred a traditional peppercorn one to cut through that meatiness. Very delicious, and with 4 other flavours to choose from, I will recommend the Bearnaise as that clarified-butter-emulsified-in-egg-yolk sauce sounds a decadent one to give it an extra umami body (Peppercorn was chosen as this was just one of the many less healthy restaurants intended). £1 for the sauce. OK, I need my sides and there we got the Dripping Cooked Chips (No fries over here I’m afraid as this is British pride!) (£2.50) and Today’s Market Green (£2.50) – Poached broccoli salted lightly, this was cooked simply but tasted so fresh and crunchy. Delicious! And yes, we did end the meal with a rhubarb compote dessert that tasted so fresh and elegant! Not exactly a £10 restaurant, I was still satisfied even when the bill added up to about £20 each! Great service and food, how could we not recommend! Located on the second floor of Chijmes, it might not be the most conspicuous location, but this chic – looking Coriander Leaf still receives a sizeable number of customers as we continue late into the night. I always have my reservations for tapas in Singapore as they are always, like what the foreigners I met a couples of weeks ago describe as, anorexic portions served at an exorbitant price. Which truly enough is exemplified by Coriander Leaf to a certain extent. Food is decent, not bad and I say listen to the recommendations from this immaculately dressed lady there as she really knows what’s good. Menu broken into 5 different categories, from which we had 1 each. 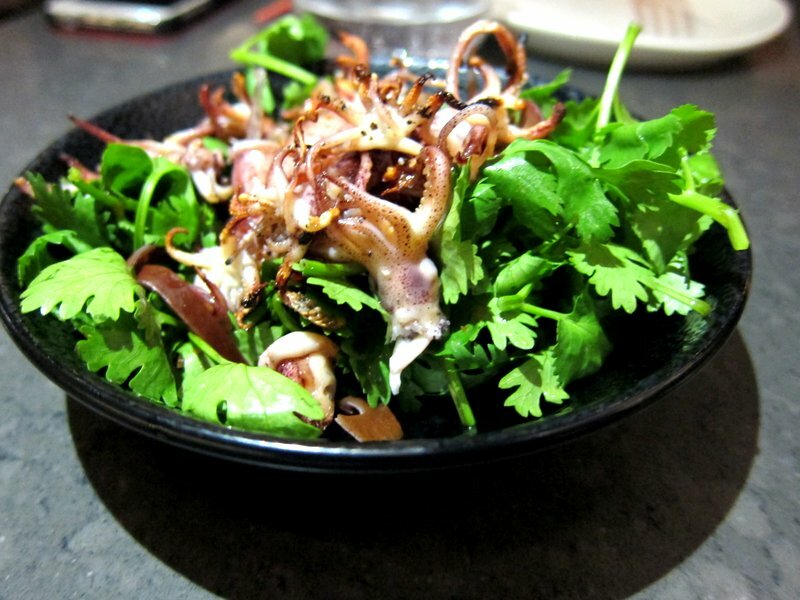 Coriander salad with wood ear mushroom, chilli and barbecued baby squid. While I was hoping for a really refreshing mix, this looked and tasted more like a garnish than a wholesome salad, as it was lacking the fragrance that it really just needs. Tasting sour throughout without really much flavour, the pairing between the barbecue squid and coriander seem out of sync. $12. The other salads though, sound more appetising than this. 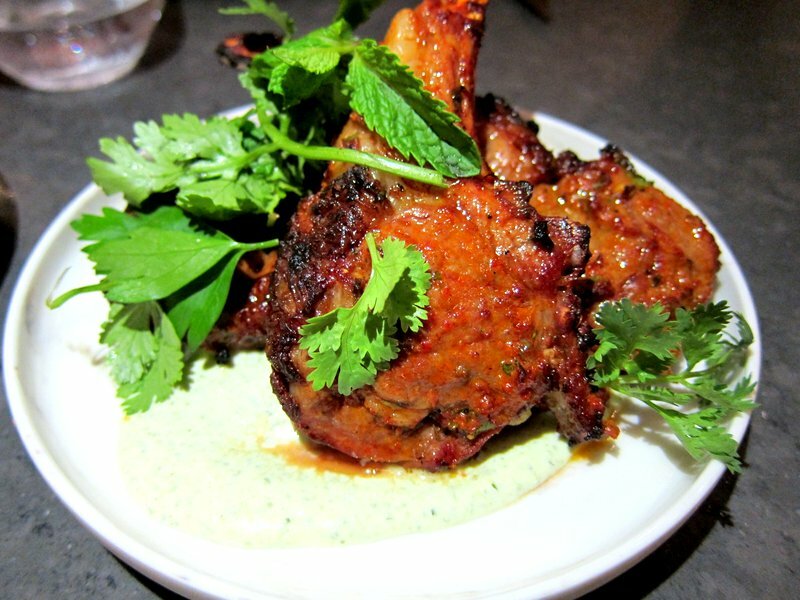 Charcoal grilled baby lamb chops with harrisa pepper paste, yoghurt, dried chilli paste and pickled onions. These were delish, the thick pepper and chilli paste overcoat that the smokey tender lamb chops had, lifted the savouriness of these smokey tender lamb chops. $29. 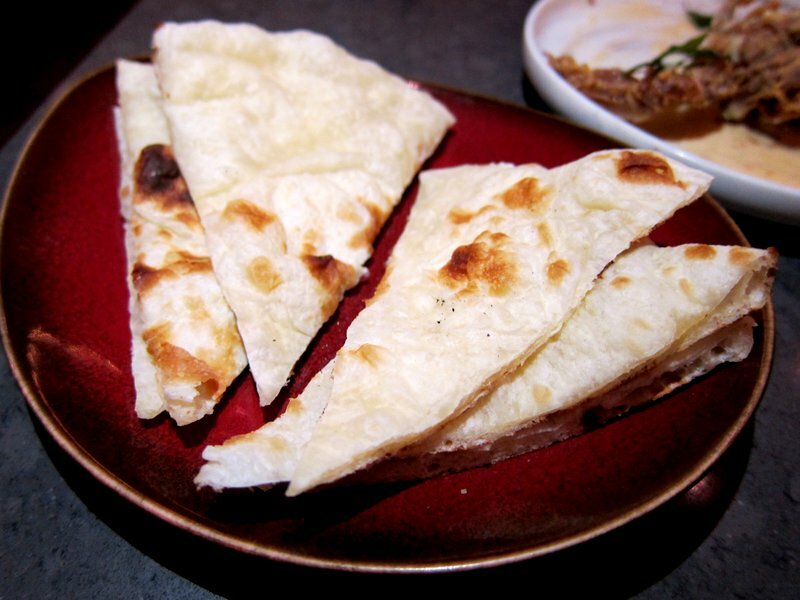 Before we forget the unassuming looking Naan, they paired really well with all our dishes. Very well balanced texture over here; stretchy and yet so fluffy. $3. 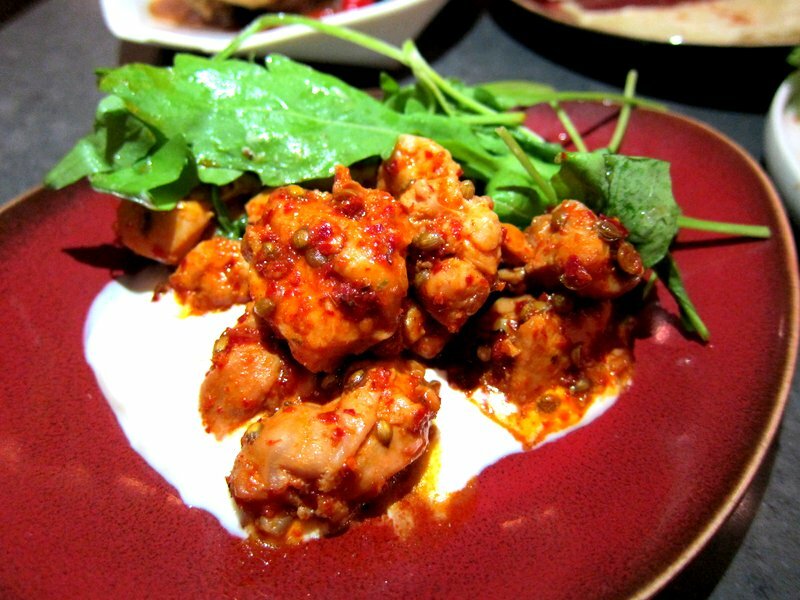 Samia’s signature frontier chicken, coriander seeds, chilli, yoghurt cream, mizuna and lemon. These coriander seeds tasted somewhat slightly similar to peppercorn and together with the yoghurt cream by the side, this dish felt interesting and szechuan / Indian influenced in flavour. $20. 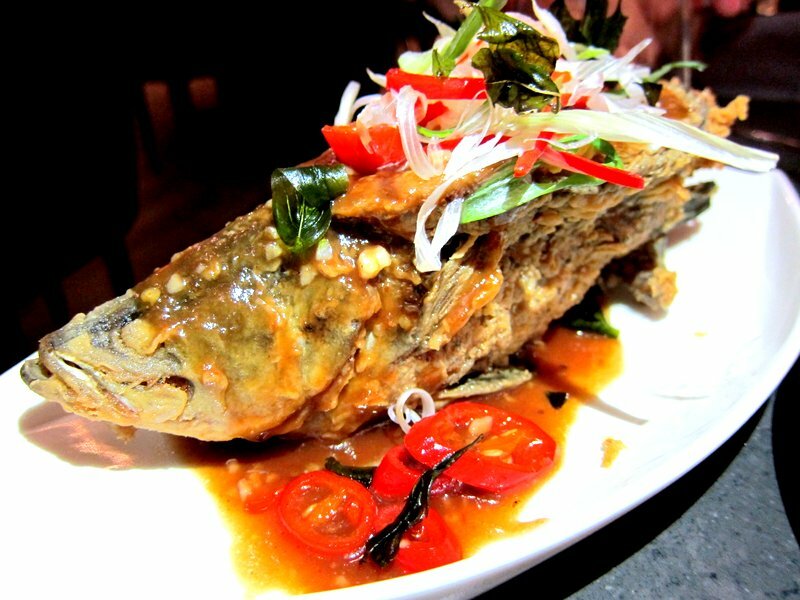 Fried baby market fish, tamarind, palm sugar, fish sauce, chilli padi. 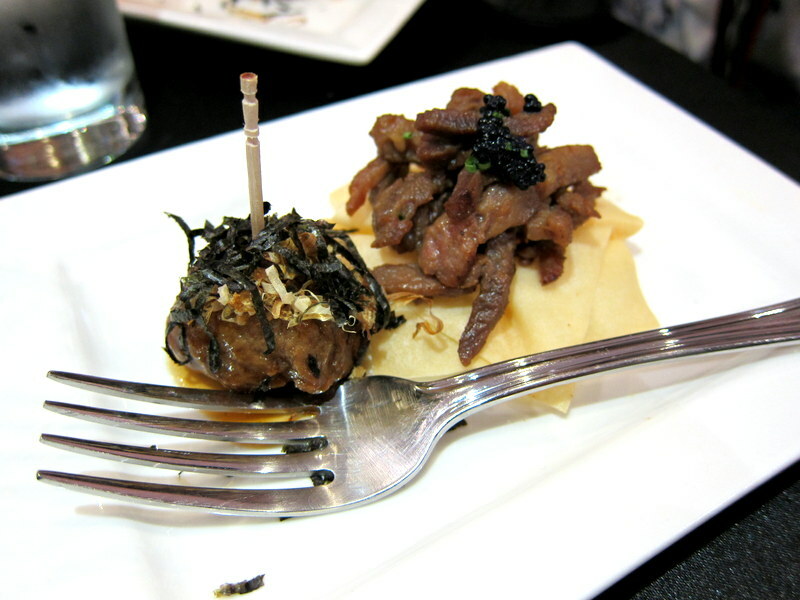 The best dish of the night, and one that isn’t anorexic without a heavy price tag. Super crispy fish lashed with the umami tasting fish sauce spiced up with the chilli padi, it was a overall familiar taste that excelled on the Asian tastebuds. $20. 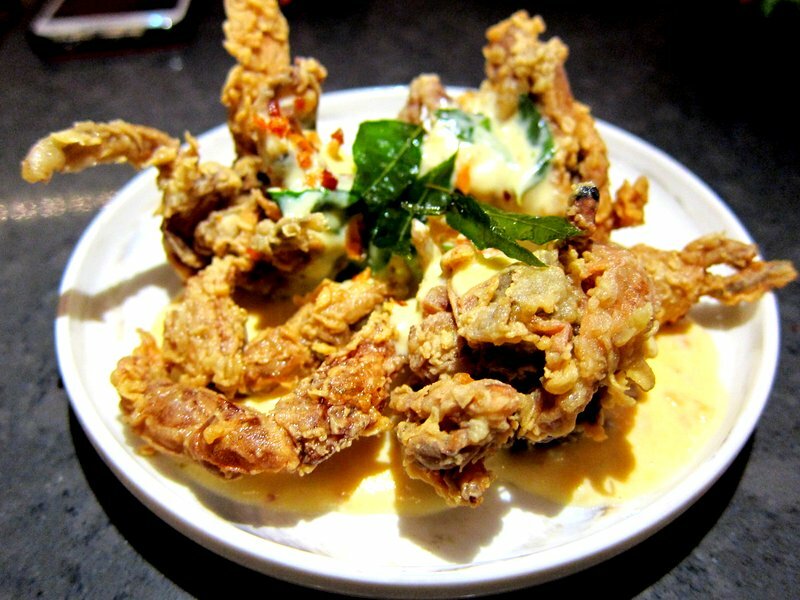 Soft Shell crab, salted duck egg yolk sauce, curry leaves. This must sound like a must order for most I believe which indeed went well with us with its robust, thick creamy egg yolk sauce. $18. 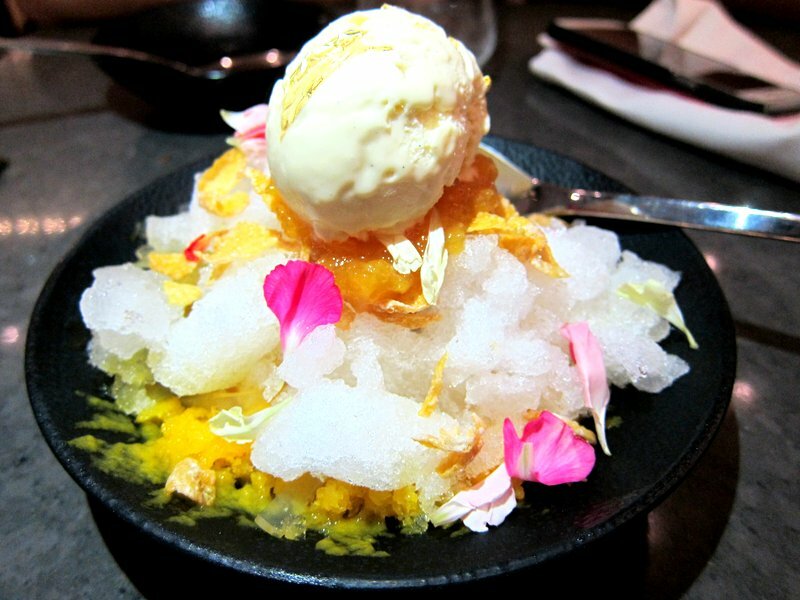 White rabbit condensed milk ice cream, mango granita, leche flan, sweet potato, jack fruit, frosted flakes, shaved ice. The initial thought of forgoing desserts for another restaurant was reverted when we saw how beautiful and luscious they looked when served to other tables from afar. And the regret set in immediately after a spoonful. Really rough, bland unevenly shaved ice which felt more like ice cubes. The tastes of the many seemingly alluring ingredients unfortunately could not manage to reconcile with each other and it was quite a complicated mess. $16. I reckon the other desserts that go with a theme will be the safer options. 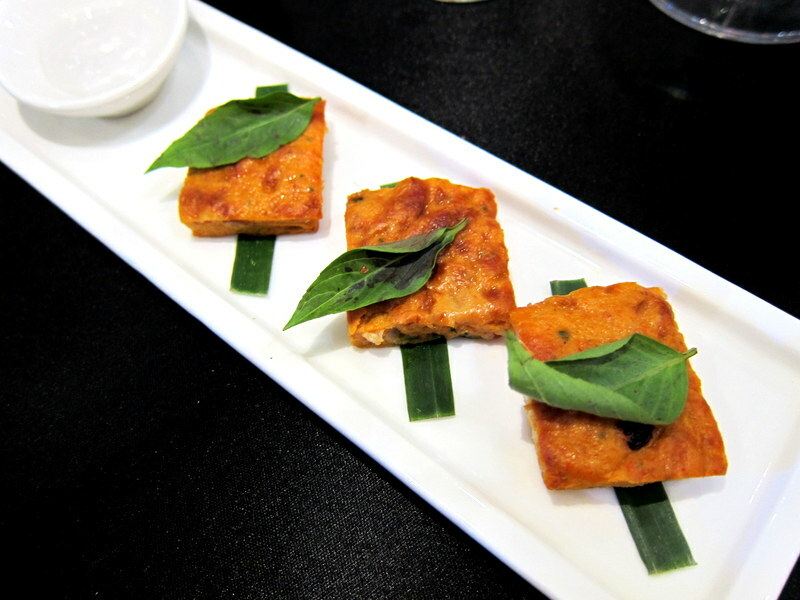 Definitely fusion-oriented, Coriander Leaf still remains a decent restaurant despite some of its misses in this dinner as they seem to have the potential. 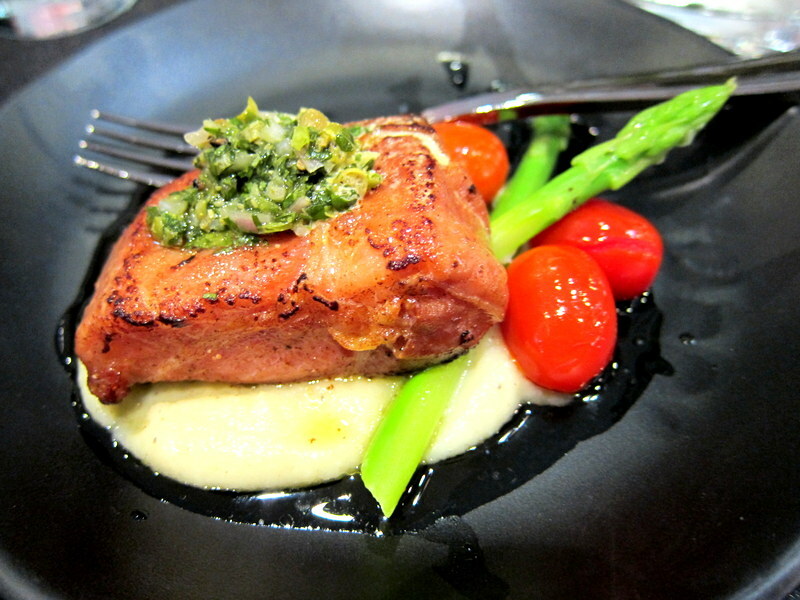 I reckon, go for the more familiar dishes that have a theme and leave the unexplored to the waitress to decide for you! 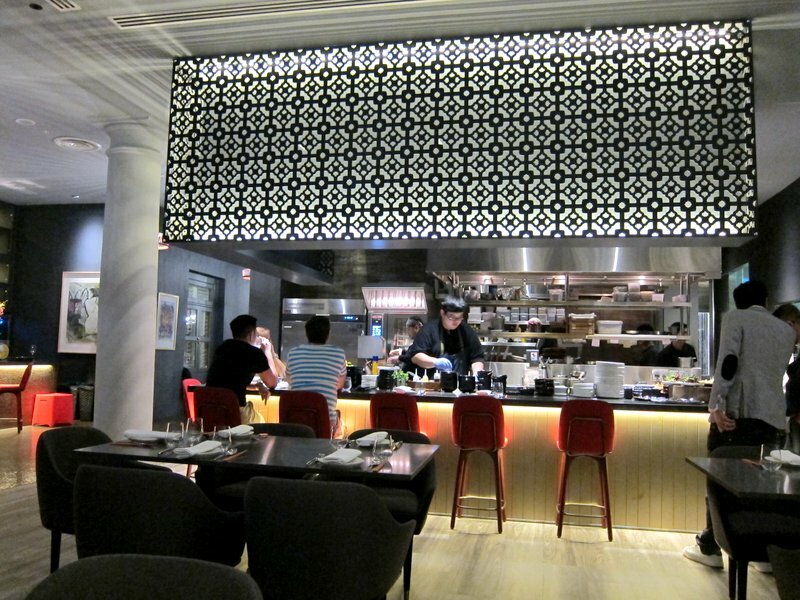 Then again, service is pretty good while ambiance is definitely lovely for a slow, relaxing meal. 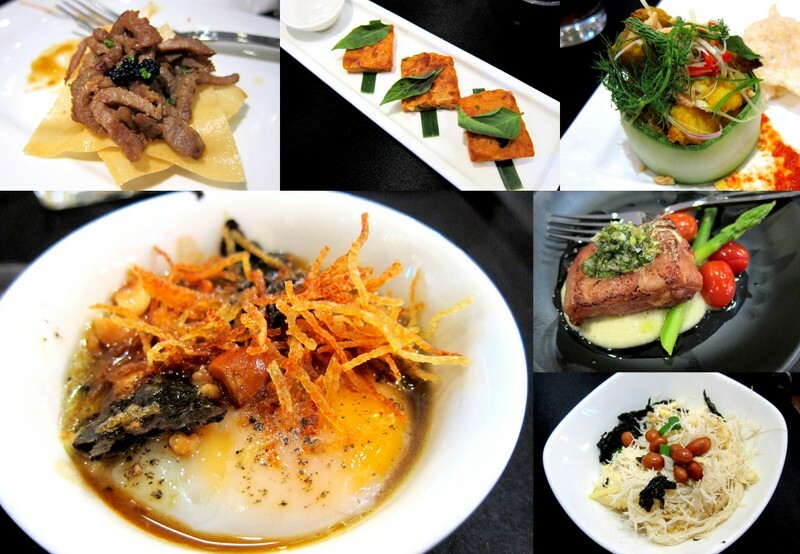 Exciting culinary Creations at Ion Orchard – The restaurants to look out for! What an exhilarating night to end the busy week with; a beautiful culinary fest organised by Ion Orchard, where 6 heavyweight restaurants were gathered to whip up their signatures, mostly only available in this gargantuan mall! 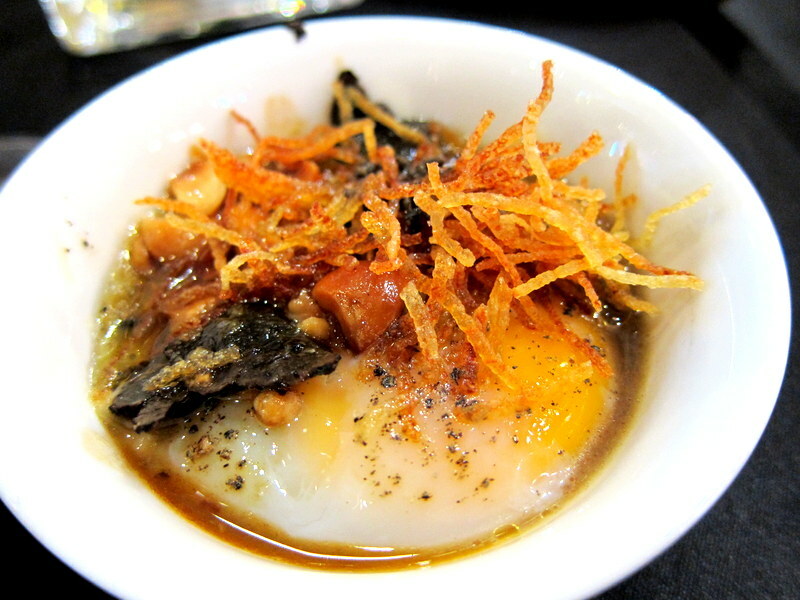 Sous vide Egg confit – so well prepared that the runny, luscious yolk looks ready to explode anytime. 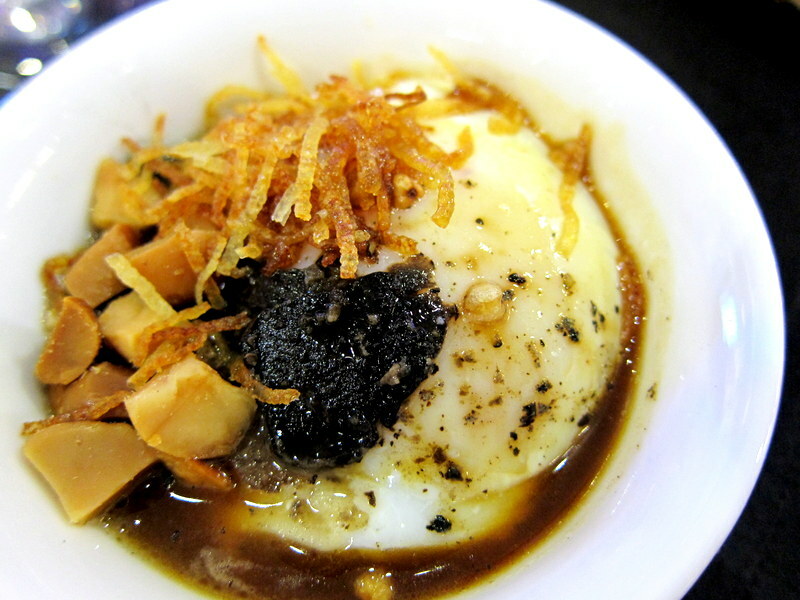 Emanating from the egg, you could get a distinctive whiff of the aromatic truffle aroma while the crunchy macadamia nuts perfected the overall texture! Delicious! Nara Thai Thai Otah with creamy coconut dip. This was decently good but just a tad salty to our liking. Kobe beef that melts in your mouth literally. Usually mistaken as just a figure of speech, we were told that the sashi fatty content of these well marbled meat actually starts to dissolve at low temperatures, thereby creating that magical ‘melting’ sensation. And its immensely fragrant flavour was contributed by the inosine (nucleoside) and oleic acids (fatty acid) abound. The Marmalade Pantry Halibut fish wrapped in razor thin bacon. The concept behind it; the immensenly fragrant pan fried bacon helps to lift the overall taste of the halibut fish, making it a slightly heavier tasting dish. Really fresh and chunky halibut within but I reckon the bacon renders it a little too salty. 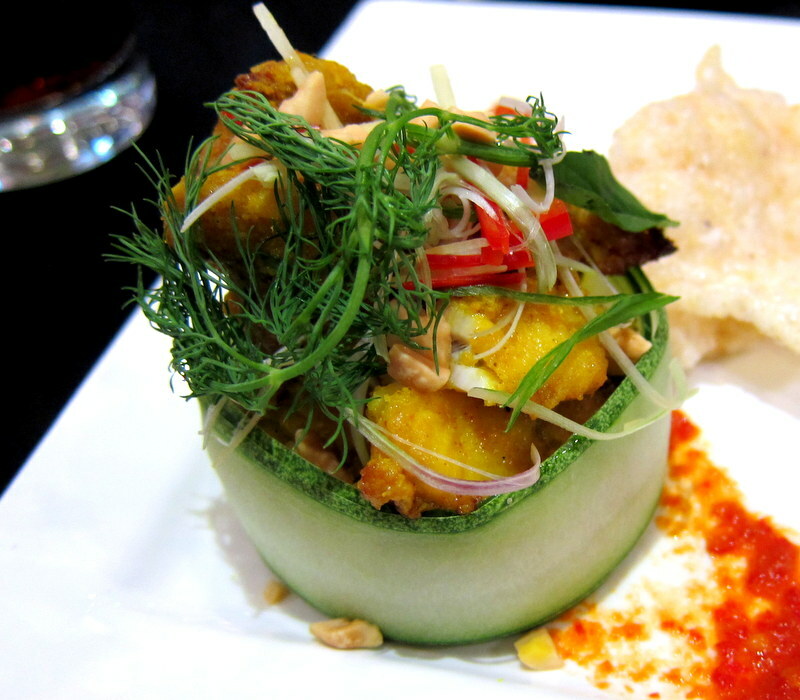 Cha Ca La Vong – Turmeric catfish fish with dill! Popular traditional dish made posh I say, the clever use of colours over here definitely has injected vibrancy into this dish. Hailing from Hanoi, its apparent popularity could be realised from a street that was named after it. Grilled and pan fried with a generous serving of dill and spring onions, its savouriness is balanced off perfectly by the refreshing, zesty rice noodles hidden underneath! 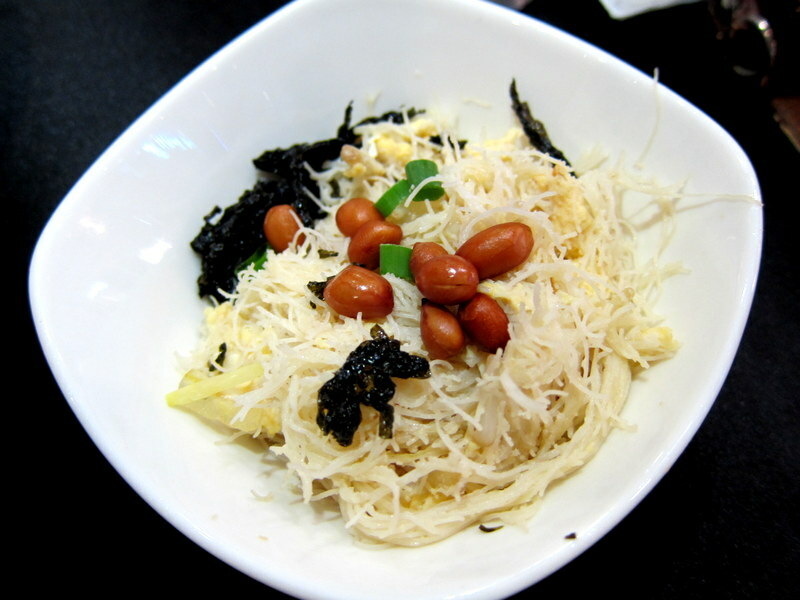 Pu Tien And our last dish of the night – Bee Hoon stir fried with Soy milk that hails from the Fujian region. Its method of cooking must have pricked the ears of the health-conscious. Though slightly lighter in tasting, the vermicelli tasted especially fine and uniformly fragrant and you know why when the chef constantly tosses the noodles with his chopsticks. Meticulous indeed! Thank you ION Orchard for this wonderful night!